Great place to stay. Very family friendly. Everything you want, location, ammenities, atmosphere and intangibles. 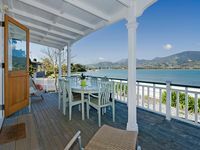 Highly recommend this beautiful house for a go to place to stay in Nelson region.